Tuesday 5th January 1915: Mrs Cochrane-Forster of 20 Kimbolton Road, Bedford has received letters from her daughter Bee who sailed for India with her four year old son Gilbert and a French governess Mademoiselle L. Coller. 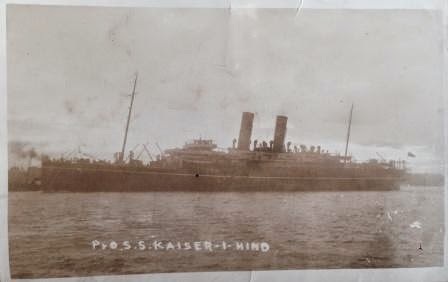 They left London on the P and O vessel S.S. Kaiser-i-Hind on Saturday 2nd January, travelling second class. She says there a large number of sailors on board the ship travelling to Gibraltar; these are also travelling second class apart from the officers who are in first. As a result the small second class saloon is rather overcrowded, though she anticipates matters will improve once it is warm enough to sit on deck. On the first night the ship anchored off Southend and the passengers were instructed to draw the curtains over the portholes. On Sunday night they anchored at Plymouth, where she was able to have the letters taken ashore. The food on board is quite good, though the children’s breakfast is at the early hour of 7.30 and the adult passengers dine at the “awful hour” of 6.30, which leaves both Mrs Chaldecott and the governess hungry and struggling to sleep. Gilbert, fortunately, is sleeping well. Both Gilbert and Mademoiselle are fine but she is suffering from some motion sickness, though she is all right “if I lie down a good deal”. Fortunately Mademoiselle “really is being a brick” and is taking good care of the little boy. They have seen some wrecks from the terrible gales and a submarine quite close. On one occasion they were stopped by a government boat. She was told by a sailor that the mine field is altered each night, so the pilots have to be told the safe channel every day. Gilbert has made friends with two little boys who are travelling to Egypt with their baby sister to rejoin their parents, and with a little girl travelling with her mother. There is plenty of deck space for the children’s games and Bee finds it “a very fine boat”. She was anxious for a time as she was unable to track down the case of milk she had brought with her, but it eventually turned up in the butcher’s refrigerator. Mrs Evelyn Beatrice Chaldecott was the wife of Captain William Henry Chaldecott of the Royal Engineers. In the letter the governess is called Mlle Collins, but the ship’s passenger list gives her name as Coller.